I've been a huge fan of Danny O'Keefe for more than 30 years. And after a long time waiting - he's back with a new album, In Time. Check out Danny's MySpace to hear four cuts. And listen to all four - the only thing they have in common is the intimacy and poignancy of the lyrics and music. Best known for his hit, Goodtime Charlie's Got The Blues, O'Keefe wrote a number of songs that became hits for other performers, most notably Jackson Browne's version of The Road that appears on his "Running On Empty" album and Judy Collins' cover of "Angel Spread Your Wings" on "Judith". I've often thought that Danny is the most brilliant lyricist I've hear heard - and after all this time - I still feel that way. I remember the unexpected jolt I felt when I picked up Breezy Stories, his 1973 album. Complex, poetic, heartfelt lyrics combined with incredible arrangements. I hadn't heard anything quite like it before. I searched him out and saw him perform whenever I could. And wasn't disappointed at all when I grabbed his next album, So Long Harry Truman in 1975 with wonderful harmonizing by Linda Ronstadt, Don Henley and Glenn Frey,among others. American Roulette was released in 1977, containing one of my favorite O'Keefe songs, You Look Just Like A Girl Tonight and has become even more as I get older. The Global Blues was released in 1979 and then Danny seemed to disappear from my life. In 1984, The Day To Day was released and then rereleased in 1989. Two songs, Along For the Ride and Someday, supposedly charged in the 20's on the AC charts - but I honestly never heard them on the radio. Someday is one of my favorite songs on this album. I've added it to my growing list of "songs no one knows about that I wish Clay Aiken would cover". Yeah, fat chance! But what does all this really mean to me? Then I had a really long dry spell. I knew that in 1998, O’Keefe founded the Songbird Foundation (www.songbird.org), which seeks to protect songbirds and their habitats that are being destroyed by deforestation caused by non-sustainable coffee growing practices in Latin America. The Foundation educates and encourages coffee-drinkers to drink sustainably grown coffee rather than sun-grown coffee. Sustainably grown coffee is shade grown, organic, and Fair Trade. Who's voice is this that sings? Playing pieces of the rain"
Alison Krauss does a lovely version of "Never Got Off The Ground" from this album on her Forget About It cd. And Sheila is a song I never tire of hearing. Well, Well, Well is a song Danny co-wrote with Bob Dylan and Outlaw is an insightful song about love and fame. There's not a song on this album I skip - but that's pretty much true for all my O'Keefe albums. To get a feel for the brilliance of Danny's lyrics - go to his website, Danny O'Keefe and click on Song Lyrics. After Don't Ask, a collaboration with his long-time associate Bill Braun was released in 2003 Danny seemed to disappear. The music business is one I'll never understand. To me, Danny O'Keefe was a brilliant artist deserving of wide recognition. But for some reason, he never became a household name and there are so many people who have never heard of him. I made do by playing his songs and googling name every once in a while just to see what he was up to. Finally, just the other day . . . I Hit Pay Dirt! 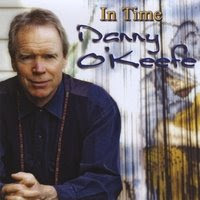 Danny O'Keefe released a new album, In Time and I bought it right away. It's on repeat constantly. Danny, thank you from the bottom of my heart. Your music touches my soul.